Having studied Graphic design at Winchester School of Art, what inspired you to start an Interior Brand? After finishing university I interned for 6 months with multiple publishing houses - helping out on a wide range of magazines including Harper’s Bazaar, Elle Decoration and Square Mile. After a few years working as a layout designer for Junior Magazine, I worked for Square Up Media and worked my way up to Deputy Art Director. A combination of my 8 years in the magazine industry, love for all things geometric and interest in reupholstering and textiles lead me to where I am now. I founded LUMETRICA in 2016, where I began creating bespoke cushions and working on re-upholstery commissions. 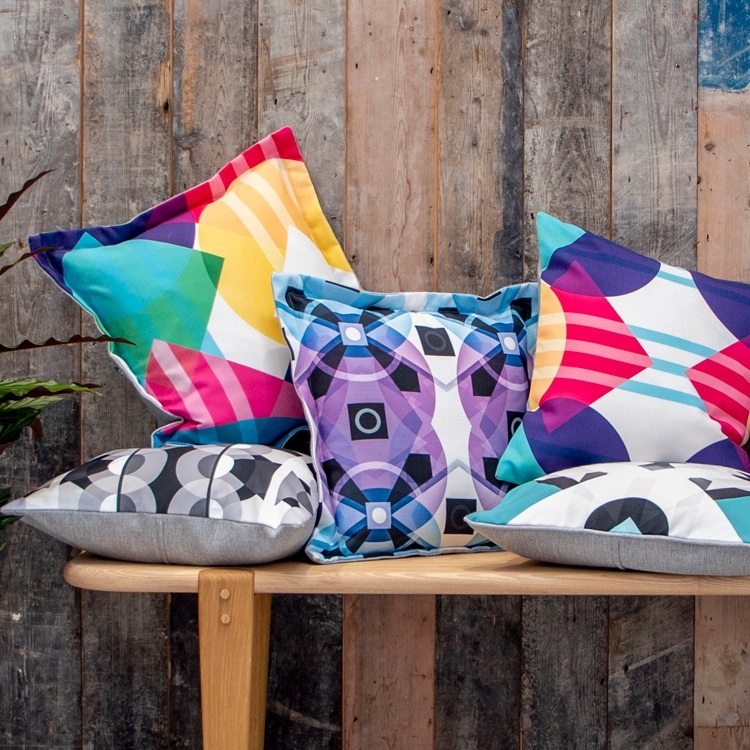 LUMETRICA has now evolved to be a homeware design studio specialising in geometric surface print. The business includes coordination of manufacturing, bespoke surface pattern design services and also offers standalone licensing of designs. Your patterns stand out from the crowd, where did you acquire a love for geometrics and your distinct style? I think my love of geometrics somewhat stems from my love of beautiful layout design. Ultimately I love organising and displaying information in a way which is visually balanced and ordered whilst considering the negative space too. 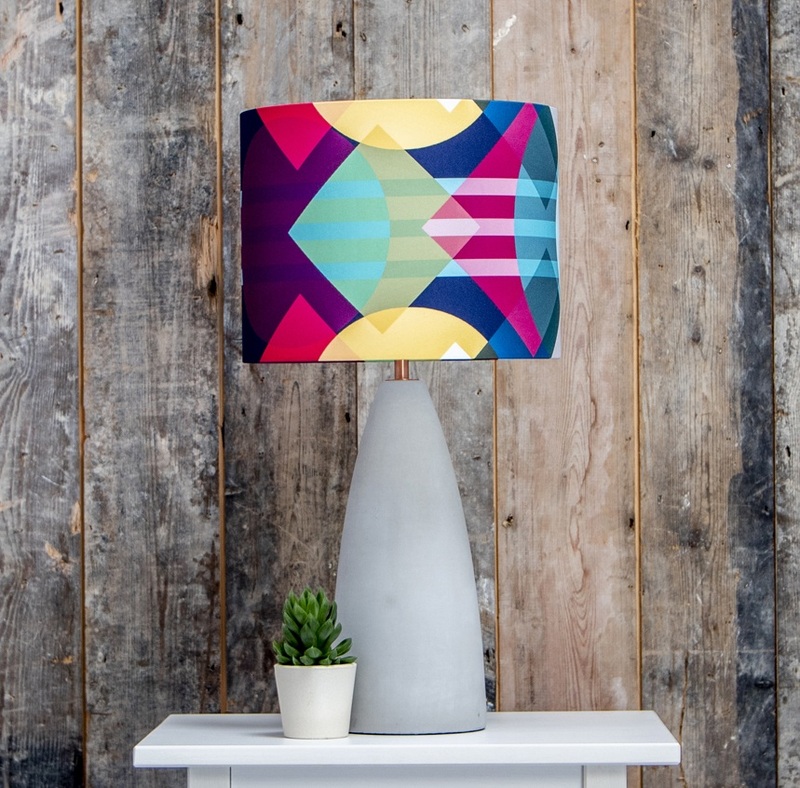 With a passion for geometrics and an incredible eye for colour how do you create your patterns? LUMETRICA’s “Collide collection” was created digitally using Illustrator. The idea behind my launching collection COLLIDE is like a kaleidoscope; an explosion of energy merged with fractal like patterns of intricacy. Each design is made up of carefully curated intersecting shapes forming an array of beautiful geometry. They share the collective idea that a collision of individual elements can create something beautiful. Do you think your career in graphic design has helped you shape your brand? Yes, absolutely. My experience over the years began with the study of graphic design, this lead me to the world of magazine publishing and opened up subsequent creative doors to me. Do you plan to expand your product range? We can see wallpaper, Gifts, Stationary and much more on the horizon. Yes, I hope to add to my product range in the future. I’d love to explore my patterns on ceramics! I’m also looking to have conversations about licensing my patterns to different brands for their products ranges. What’s been your biggest challenge in creating finished products? The finished products require an incredible amount of detail in order to achieve the end result I envisage. Particularly the cushion covers, I’ve worked really hard to get them how I would sew them myself. Everything from the crop of the pattern to the specific colour of the top stitching needs to be outlined clearly to the manufacturers. Do you print and make as orders are received, or hold stock? With a 2 month old baby and all my samples, my home is already jammed packed! So holding stock is not an option. I print orders as they come in, that way my clients are able to choose multiple patterns and unlimited quantities. Congratulations on being shortlisted for the Top Drawer Spotted Awards! That’s a great achievement and one that has launched many brands what’s next for LUMETRICA?